Melbourne has seen an explosion in property price growth recently, with the latest figures from the ABS showing the house prices have increased a whopping 13.2% over the last year. In light of this trend, you might be wondering where to buy investment property in Melbourne. Here are some of the city’s promising hotspots for 2018 and tips for choosing the right location. Traditionally working-class suburbs of Melbourne are slated to be some of the strongest growth areas in Melbourne this year. If you’re planning to make the leap into investment property or expand your portfolio in 2018, consider these top-performing suburbs. Property demand has recently skyrocketed in Werribee, situated 32 km south-west of the CBD. The suburb saw a huge 665% increase in auctions last year compared with the previous year, according to CoreLogic. Plus, with average growth of 9.3% and mid-range prices the area has a good mix of affordability and growth potential for investors. Located 16 km to the north of Melbourne’s CBD, Campbellfield has seen a favourable 13.8% annual price growth, combined with an accessible price point. The suburb is particularly attractive to investors, thanks to its high rental returns, which, along with low vacancy rates of 0.7%, makes it an investment hotbed. The area is also well positioned for continued economic growth with total investments of over $225.8M currently taking place. Neighbouring suburbs Melton South and Melton in Melbourne’s west are showing promise this year, with high rental yields and strong median house price growth. The low-cost housing also makes the area particularly attractive to investors who are looking for affordable but strategic options. Laverton is located south-west of Melbourne’s CBD and boasted strong annual growth in 2016 while maintaining an affordable price. Average rental yields are healthy while vacancy rates are relatively low, indicating high rental demand. Demand is likely to continue thanks to the suburb’s proximity to public transport and major future investments for the allocated infrastructure in the area. Situated on Melbourne’s south-eastern outskirts, Pakenham is a growth area where housing and infrastructure are set to boom. Vacancies are at a favourable low of 1.4%, and the area is home to many new-build properties, meaning there are plenty of properties ready to be bought and rented out as is. Located a manageable 18 km north of the CBD, Dallas is an affordable, family-friendly suburb. Return on investment is particularly high for units, averaging a cash flow of $328 per month. The vacancy rate is also just 1.2%, so it’s unlikely you’ll have to deal with costly long-term vacancies in this high-demand area. Roxburgh Park in Melbourne’s north offers reasonable affordability and has recorded a healthy annual price growth since 2016. Investors can expect good returns with high rental yields and low vacancy rates of 1.3%. Current infrastructure and residential developments are also likely to ensure demand for property in the area remains high through this year. Chances are high that you’ll be taking out a loan to fund your investment property, so you want to make sure that average rent for the area is comparable to your mortgage repayments. In areas where rents are especially high compared to the property value, you might even be able to enjoy a cash surplus after you’ve made your monthly loan repayment. Tenants moving out frequently can be costly for landlords, due to periods with no rental income and the associated costs of putting your property up for rent. A high vacancy rate can also indicate that the area isn’t a desirable place to live, which could make it difficult to rent out or sell in future. Low vacancy rates mean more security for you in terms of guaranteed yields and resale value. Keep an eye out for planned infrastructure in areas you’re considering. New public transport options, shops, parks, and other major developments often signal a significant boost in price growth and demand. 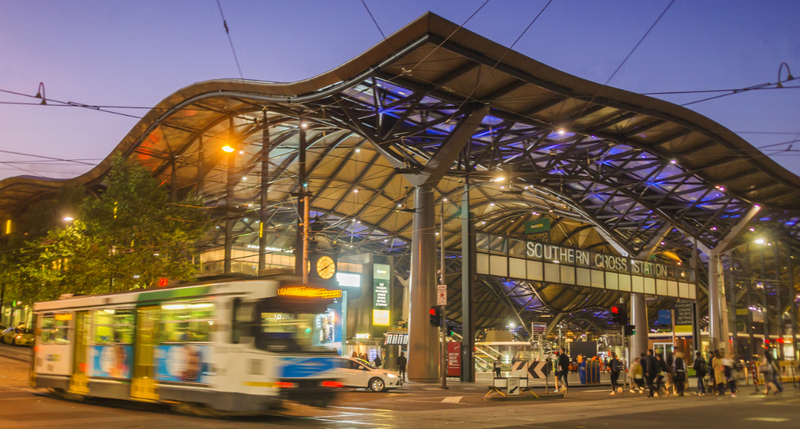 Southern Cross Station, a major interchange in the Melbourne transport network. It's important to choose an investment property that is well connect to metro areas. Whether you’re looking at a centrally-located property or one that’s further out, it’s important to choose a spot that’s well-connected to metropolitan areas. The more public transports options that are available to a suburb, the more valuable it will become over time – especially as the population grows and people spread further out of the city. Suburbs that offer lifestyle attractions tend to be favoured by buyers and renters. Look for schools, parks, walking tracks, beaches, shops, villages, and other unique points of difference when deciding where to buy a house in Melbourne. Should you find a property you’re particularly interested in, be sure to request your free online property value estimate. This report contains data from Australia’s leading real estate data providers, and will also give you access to in-depth information about the sales history in the area, and comparable property sales, for an indicator of what a property may be worth.